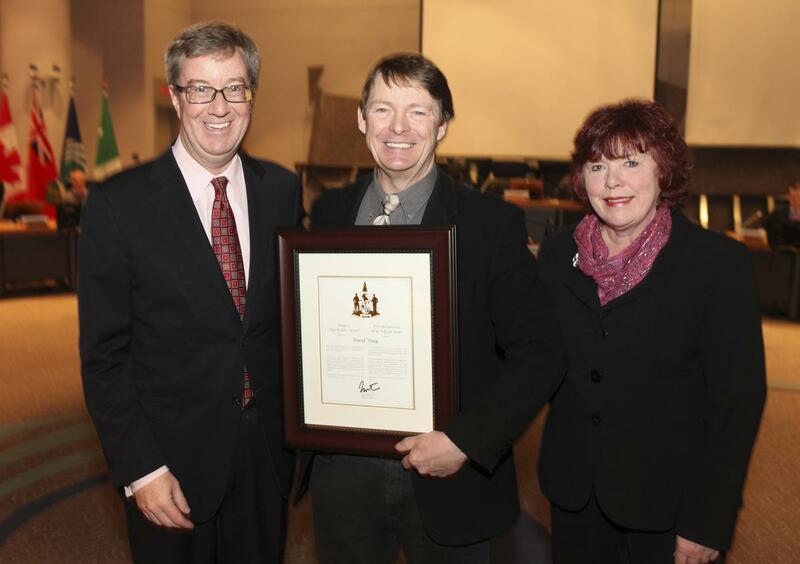 Mayor Jim Watson and Ward Councillor Jan Harder presented the Mayor’s City Builder Award to Mr. David Vesey today for his outstanding volunteer service as a coach, trainer and mentor of children in the Barrhaven community who play league softball or hockey. David is a retired teacher who taught science to local high-school students for 35 years. He has been the president of the Barrhaven Children’s Softball League for the past 18 years. Under his leadership, the league has grown to the largest of its kind in Ontario. He has devoted countless hours of volunteer service to the Nepean Minor Hockey Association. Over the past two years, he has completely revamped the league’s Initiation Program for its youngest players, ages 4 to 6, and is the head instructor for the program. He has brought fun, interactive activities and unique teaching aids to the Initiation Program to help engage and motivate young hockey players. He has also been the children’s activity coordinator for Barrhaven’s Canada Day celebrations for the past two years.